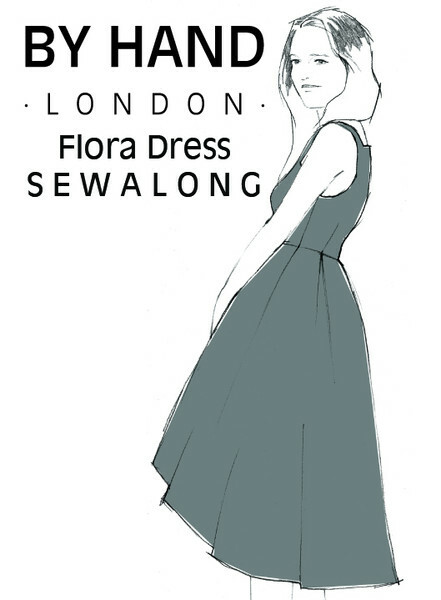 Last weekend I started on my next challenge the Flora Sewalong with By Hand London. I thought I would try something new and decided to attempt the faux wrap style version. 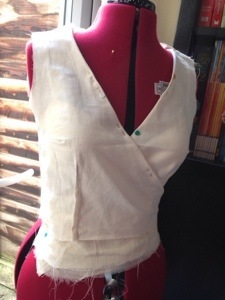 I made a Toile/Muslin from the bodice pieces first. First I traced off my mashed up sizes from the main pattern on to a roll of kiddie play paper using a pattern tracing wheel. The kiddie paper is great for creating your own pattern on as it’s cheap and fairly thin. Interested? 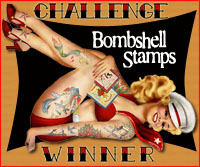 Here’s a link to it – Wilko paper roll. I then used the traced version to cut the calico from. I traced the dart using a tracing wheel and Carbon paper. I then got to work sewing the darts and bodice together for fitting. Boy was I way off, the apex points were about an inch off of my apex points! 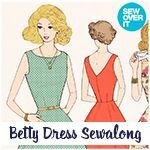 After looking at the Sewalong blog I realised that I was badly in need of a SBA (small bust adjustment). I cut my pattern and moved the darts along as the blog suggested. I then picked unpicked my darts and traced new ones ready for fitting number 2. The side bust darts were ok but the darts from the waist just weren’t right. I unpicked the waist darts and pinned the darts by hand on my dress form. The were quite different from the patterns darts but at least it fit me. I also had to pull in the seams on the shoulders which pulled the pattern up so I guess when cutting the pattern from my main material I will need to add a little extra for seam allowance at the waist. Better to have more than less!! I have now traced the dart and shoulder adjustments to my paper pattern version to make the main fabric from.